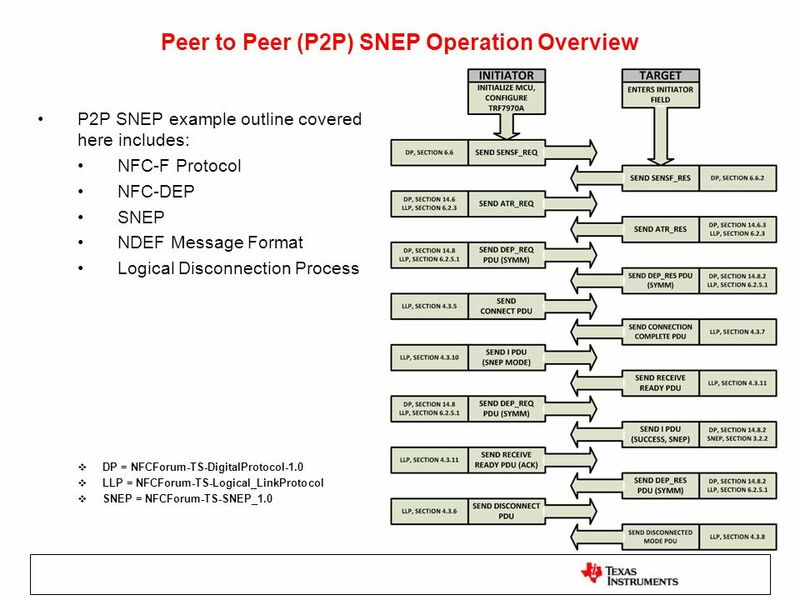 P2P SNEP example outline covered here includes: NFC-F Protocol NFC-DEP SNEP NDEF Message Format Logical Disconnection Process DP = NFCForum-TS-DigitalProtocol-1.0 LLP = NFCForum-TS-Logical_LinkProtocol SNEP = NFCForum-TS-SNEP_1.0 This overview covers placing the TRF7970A in active initiator 424kbps and interacting with another NFC P2P device (in this case NFC Enabled Android OS based handset) The SENSx_REQ (first command) determines the protocol to be followed. (NFCF or NFCA) and just like this command, the rest of the flow illustrated above and in presentation is following the NFC Forum Specifications (as listed beside each command). Once connection is established, data can flow in either direction, which is important as this is the power of the connectionless transport which Peer to Peer operation offers. 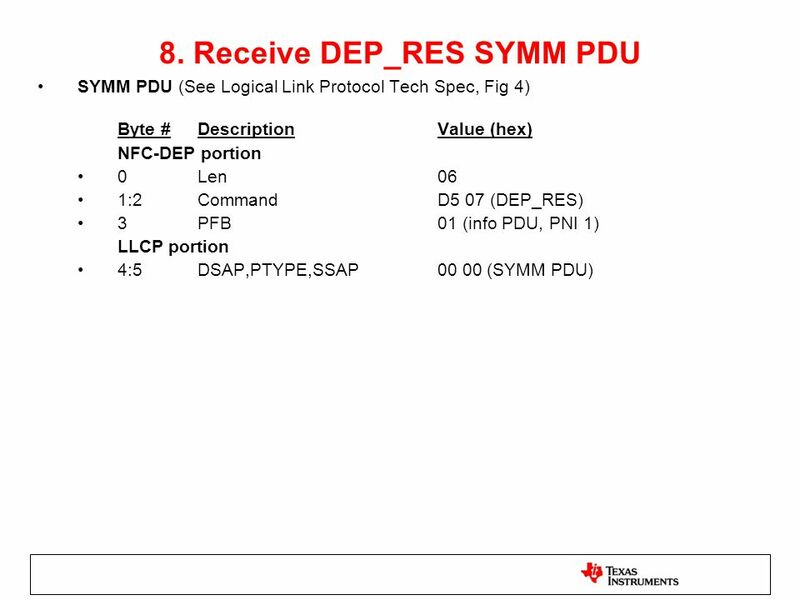 This is a simplified flow illustrated above and one thing to know about here is that the SYMM PDUs can, and for the most part are, exchanged multiple times in between their respective command steps. This topic is covered in greater detail later in the presentation. 5 1. Send SENSF_REQ SENSF_REQ (See Section 6.6, NFC Digital Protocol v1.0, Table 40) Byte # Description	Value (hex) 0	Length 06 1	Command (DP, SENSF_REQ) 2:3	System Code (SC)	FF FF (DP, Section , default) 4	Request Code (RC)	00 (DP, no system code information requested) 5	Time Slot Number (TSN)	03 (DP, Table 42, 4 time slots) SENS_F is transmitted out, then EOTX IRQ is received and handled. FIFO is cleared, etc. (just like any other command being transmitted with the TRF7970A.) 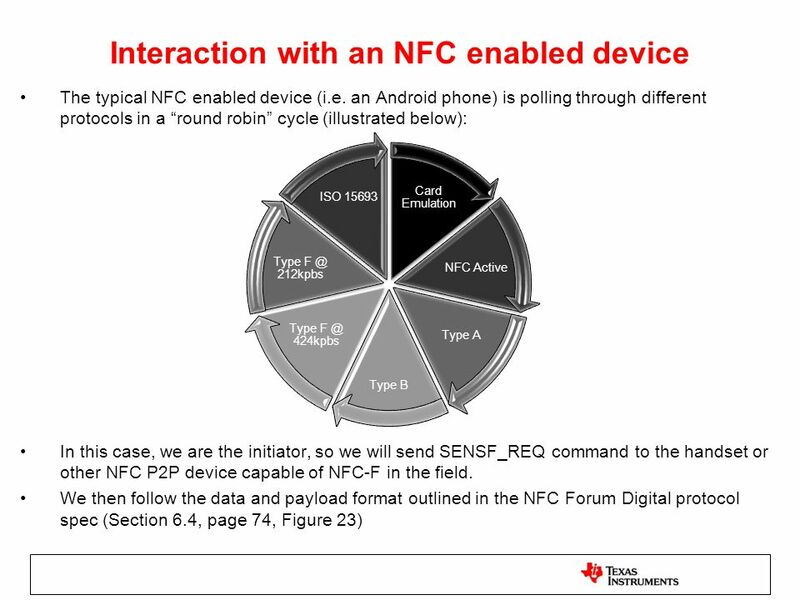 SC - The System Code (SC) contains information regarding the NFC Forum Device to be polled for (e.g., the Technology Subset). (see Requirements 80 table in DP for more information) RC - The Request Code (RC) is used to retrieve additional information in the SENSF_RES Response and Table 41 (page 76 in DP) specifies the RC code(s). TSN - The Time Slot Number (TSN) is used for collision resolution and to reduce the probability of collisions. The anticollision scheme is based on the definition of time slots in which NFC Forum Devices in Listen Mode are invited to respond with minimum identification data. 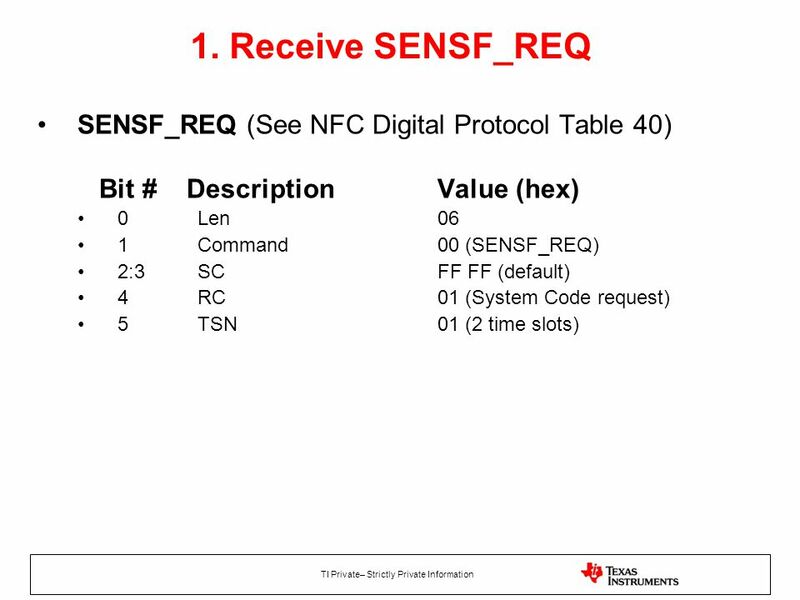 The NFC Forum Device in Poll Mode sends a SENSF_REQ Command with a TSN value indicating the number of time slots available. Each NFC Forum Device in Listen Mode presents within the range of the Operating Field, and then randomly selects a time slot in which it responds. The TSN byte set to 00h forces all NFC Forum Devices in Listen Mode to respond in the first time slot, and therefore, this TSN value is used if collision resolution is not used. 6 2. 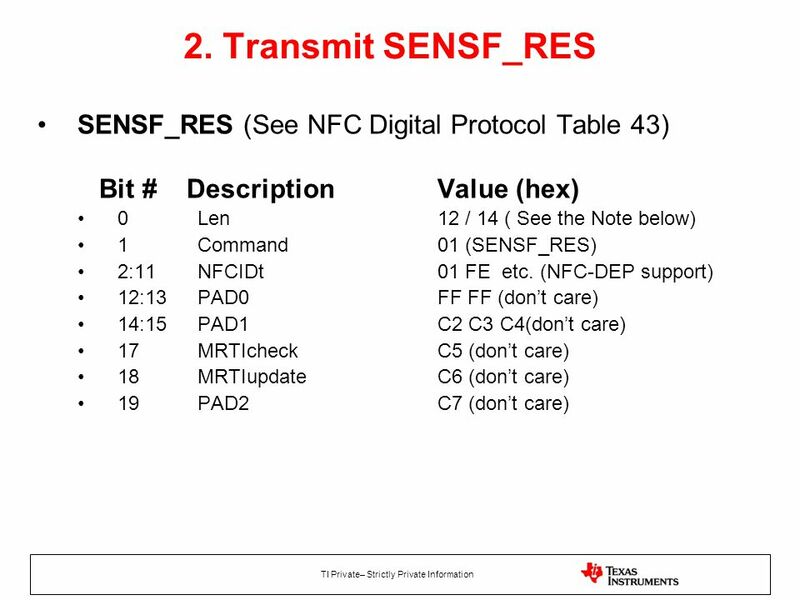 Receive SENSF_RES SENSF_RES (See Section 6.6.2, NFC Digital Protocol v1.0, Table 43) Byte # Description	Value (hex) 0	Length (or 14, see note below on RD) 1	Command (SENSF_RES) 2:9	NFCID FE 6F 5D A 0F (for example) 10:11 PAD0	C0 C1 12:14	PAD1	C2 C3 C4 15	MRTICHECK	C5 16 MRTIUPDATE	C6 17 PAD2	C7 18:19	Request Data (RD)	(only present when RC ≠ 00,sent in SENSF_REQ) EORX ITRQ is received, and FIFO status register is read out for the SENSF_RES (response) (in this case this is 18 bytes…Register 0x1C = 0x12 = DEC 18) Then the FIFO is reset, just like any other TRF7970A RX operation. NFCID2 shown is for example, each device/session will have a different number returned here. The NFC Forum Device MAY set PAD0 to a different value if configured for Type 3 Tag platform in a specific configuration. (the spec says this value must be set to FF FF otherwise) The PAD1 format depends on the NFC-F Technology Subset for which the NFC Forum Device in Listen Mode is configured. 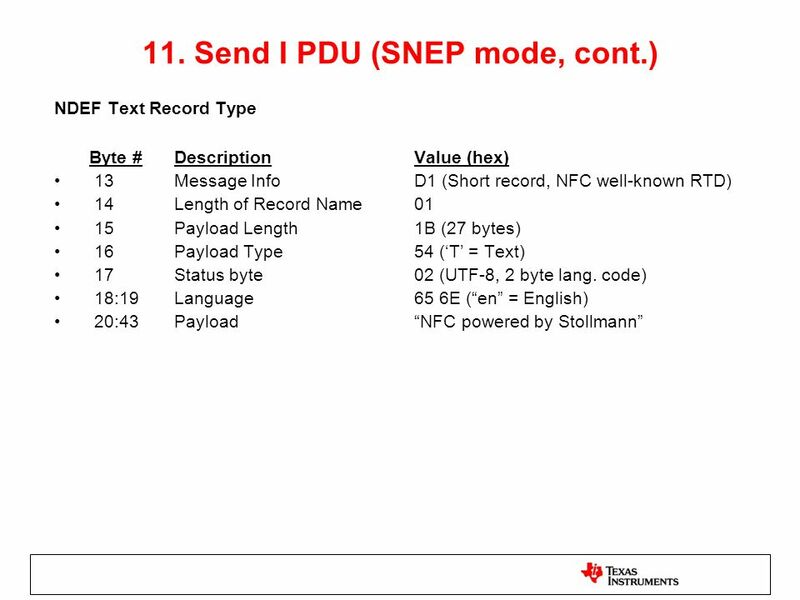 NFC Forum Devices configured for the NFC-DEP Protocol do not use PAD1. Coding of MRTICHECK depends on the NFC-F Technology Subset for which the NFC Forum Device in Listen Mode is configured. NFC Forum Devices configured for the NFC-DEP Protocol do not use MRTICHECK. The MRTIUPDATE format depends on the NFC-F Technology Subset for which the NFC Forum Device in Listen Mode is configured. NFC Forum Devices configured for the NFC-DEP Protocol do not use MRTIUPDATE. The PAD2 format depends on the NFC-F Technology Subset for which the NFC Forum Device in Listen Mode is configured. NFC Forum Devices configured for the NFC-DEP Protocol do not use PAD2. Request Data (RD) is included in the SENSF_RES Response if requested in the RC field of the SENSF_REQ Command. 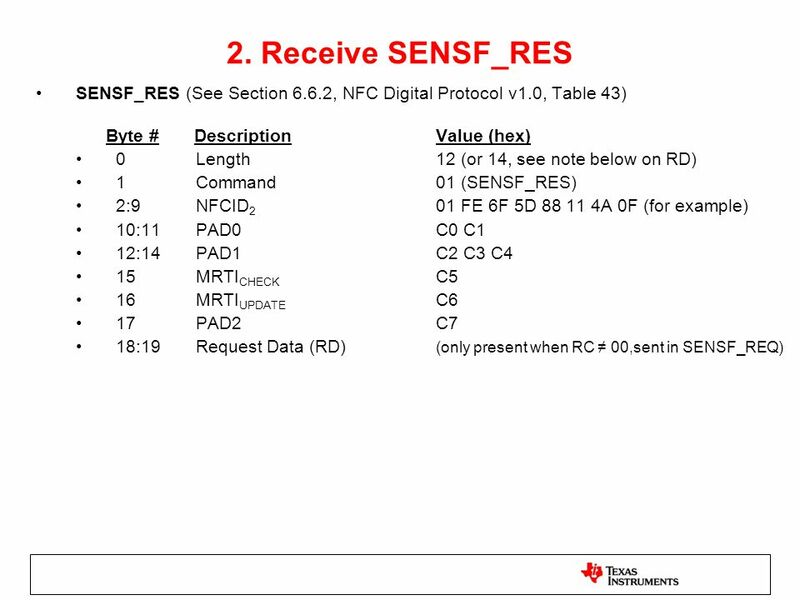 The Request Data (RD) format depends on the NFC-F Technology Subset for which the NFC Forum Device in Listen Mode is configured. 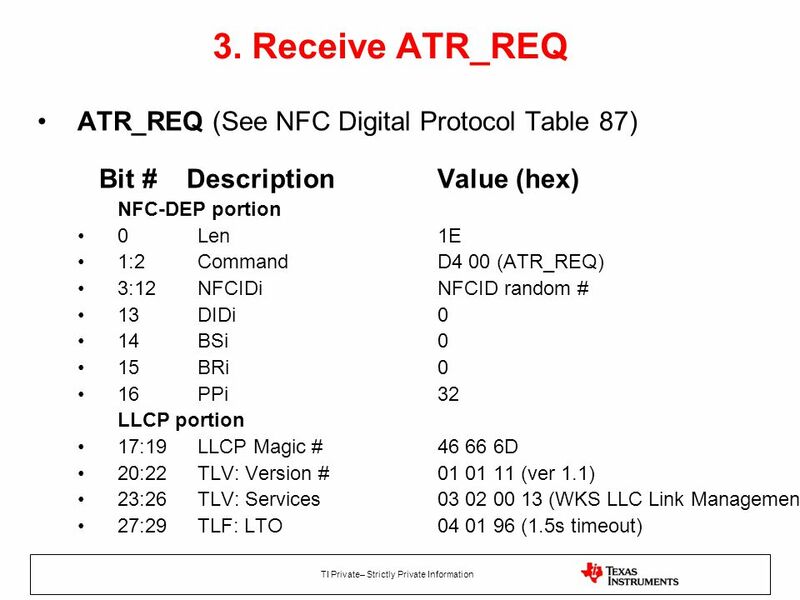 ATR_REQ (See NFC Digital Protocol, Section 14.6, Table 87) Byte # Description	Value (hex) NFC-DEP portion 0	Length (37 bytes) 1:2	Command D4 00 (ATR_REQ) 3:12	NFCID3I NFCID3I = 01 FE 6F 5D A 0F 00 00 13	DIDI	00 14	BSI	00 15	BRI	00 16	PPI	32 (max payload 254 bytes) LLCP portion 17:19	LLCP Magic # D 20:22	TLV: Version # (v1.1) 23:26	TLV: MIUX (128 + MIU (1792) = 1920 bytes) 27:30	TLV: Services (WKS LLC Link Management) 31:33	TLV: LTO (500mSec timeout, Figure 22, LLP) 34:36	TLV: Option Param (Class 3) (Table 7, LLP) Following the initialization and anti-collision procedure defined in [DIGITAL], the Initiator device sends the Attribute Request ATR_REQ command. The format of the ATR_REQ SHALL be as shown in Figure 28 of the LLP Specification. The Initiator SHALL include the NFC Forum LLCP magic number in the first three octets of the ATR_REQ General Bytes field. All LLC parameters defined in Section 4.5 Table 6 for use in PAX PDUs that are to be exchanged SHALL be included as TLVs beginning at the fourth octet of the ATR_REQ General Bytes field. The PAX PDU exchange described in the LLC link activation procedure (cf. Section 5.2) SHALL NOT be used. The ATR_REQ General Bytes field SHALL NOT contain any additional information. 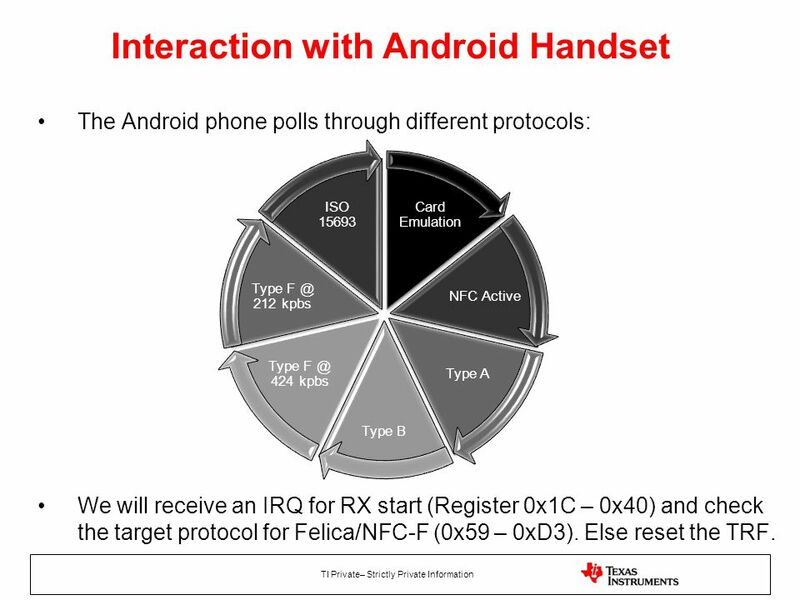 NFCID3I is the NFC Forum Device identifier of the Initiator for the NFC-DEP Protocol. The Initiator Device Identification Number (DIDI) is used to identify different Targets that are activated at one time. If multiple target activation is not used, the DIDI field is set to zero. BSI and BRI indicate the bit rates in Active Communication mode supported by the Initiator in both transmission directions. The coding of BSI and BRI is specified in Table 88 and Table 89 of the Digital Protocol Specification. The PPI field indicates the Length Reduction field (LRI) and the presence of optional parameters. The format of the PPI byte is specified in Table 90 of the Digital Protocol Specification. The NFC-DEP MAC component SHALL use the three octet sequence “46h 66h 6Dh” as the NFC Forum LLCP magic number. This magic number is encoded into the ATR_REQ / ATR_RES General Bytes fields, as described below. The use of the magic number by the Initiator and Target SHALL indicate compatibility with the requirements of this specification. The link activation phase SHALL be started when a peer device capable of executing the LLCP peer-to-peer protocol enters communication range, and the local device is instructed to perform peer-to-peer communication. The link activation phase is different for the Initiator and the Target device and is described separately for each role. 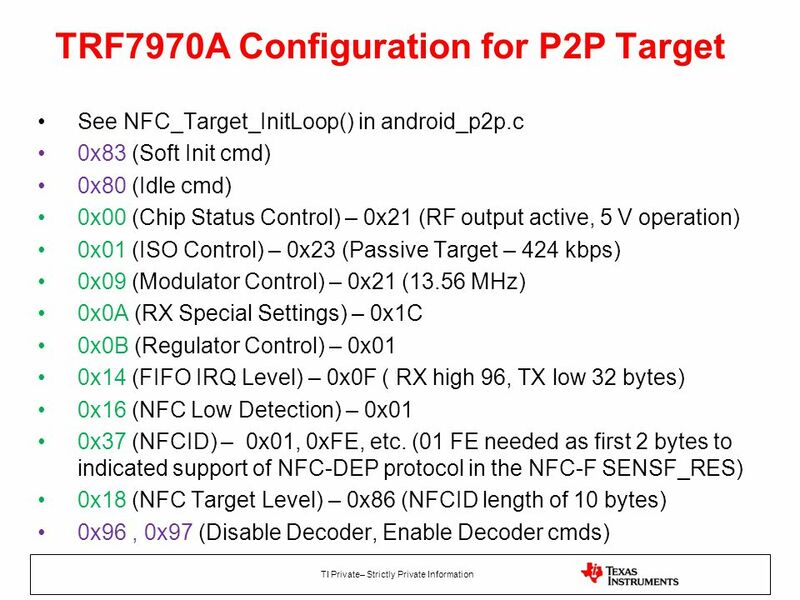 ATR_RES (See NFC Digital Protocol Table 92, LLP Spec Section ) Byte # Description	Value (hex) NFC-DEP portion 0	Length 1F (31 bytes) 1:2	Command D5 01 (ATR_RES, fixed values) 3:12	NFCID3T NFCID3T = F DF C3 28 BD 9D 94 E0 13	DIDT	00 14	BST	00 15	BRT	00 16	TO	0E 17	PPT	32 (max payload 254 bytes) LLCP portion 18:20	LLCP Magic # D 21:23	TLV: Version # (ver1.1) 24:27	TLV: Services (WKS LLC Link Management) 28:30	TLV: LTO (1.5 sec) We send the ATR_RES which is based on the NFC Digital Protocol and the LLCP documents. Following the initialization and anti-collision procedure defined in [DIGITAL], the Target device waits until the receipt of the Attribute Request ATR_REQ command. 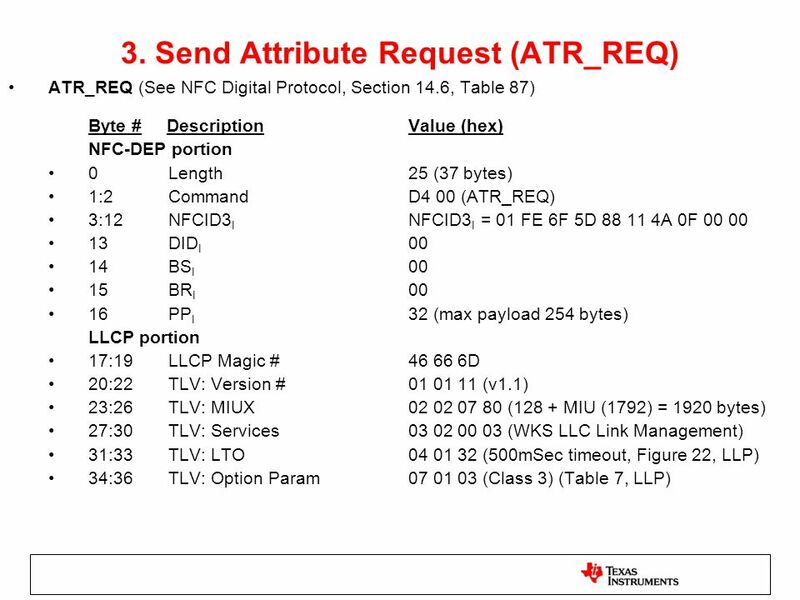 Upon receipt of ATR_REQ the Target SHALL verify that the first three octets of the General Bytes field are equal to the NFC Forum LLCP magic number defined in Section If the octet sequence is equal to the NFC Forum LLCP magic number, the Target responds by sending the Attribute Response ATR_RES, as defined in [DIGITAL]. 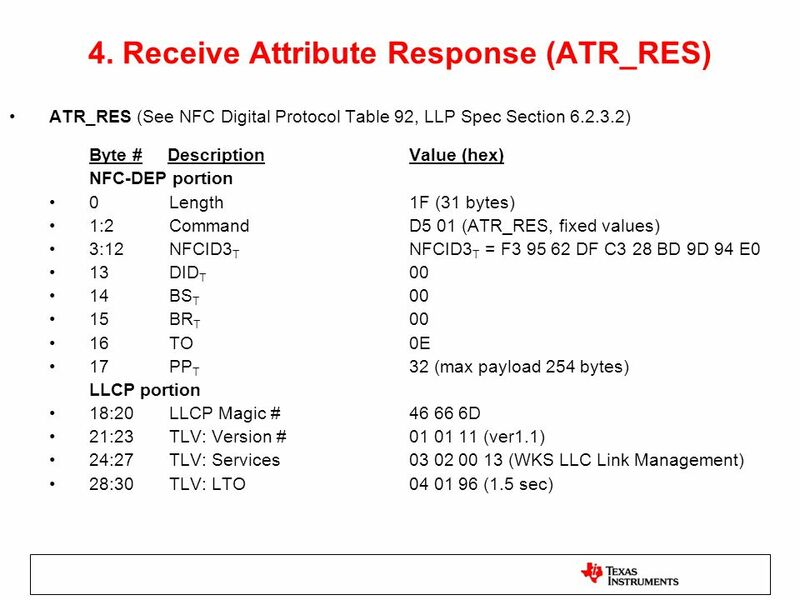 The format of the ATR_RES SHALL be as shown in Figure 29 of the LLP Spec (page 43) The Target SHALL include the NFC Forum LLCP magic number in the first three octets of the ATR_RES General Bytes field. All LLC parameters defined in Section 4.5 Table 6 for use in PAX PDUs that are to be exchanged SHALL be included as TLVs beginning at the fourth octet of the ATR_RES General Bytes field. The PAX PDU exchange described in the LLC link activation procedure (cf. Section 5.2) SHALL NOT be used. 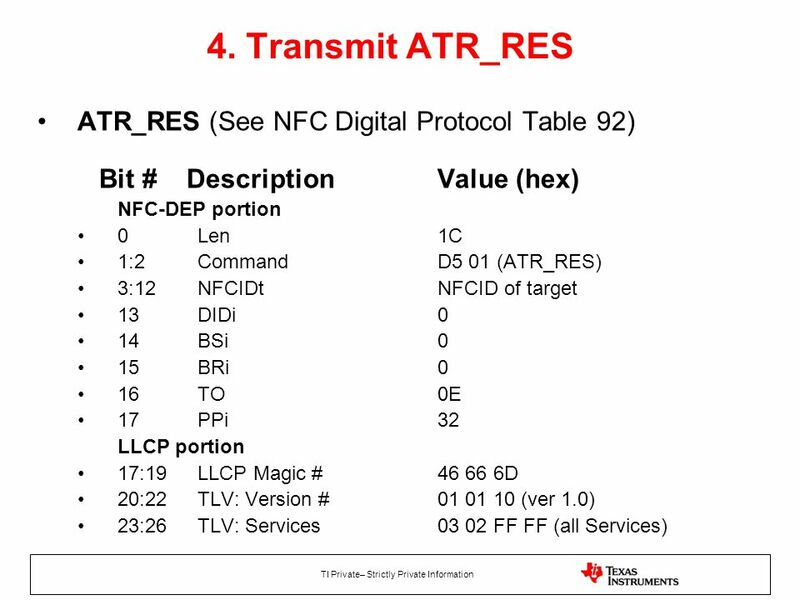 Upon receipt of the Attribute Response ATR_RES the Initiator SHALL verify that the first three octets of the General Bytes field are equal to the NFC Forum LLCP magic number defined in Section If the octets are equal to the NFC Forum LLCP magic number, the Initiator SHALL notify the local LLC component about the MAC link activation completion and SHALL then enter normal operation described in chapter If the first three octets of the General Bytes field are not equal to the NFC Forum LLCP magic number, the link activation SHALL fail. In this case, any further communication between the Initiator and the Target is out of scope of this specification and left to implementation. After sending ATR_RES the Target SHALL notify the local LLC component about the MAC link activation completion and SHALL then enter normal operation described in Section If the magic number in the received ATR_REQ cannot be verified, the link activation SHALL fail. In this case, any further communication between the Target and the Initiator is out of scope of this specification and left to implementation. 9 5. 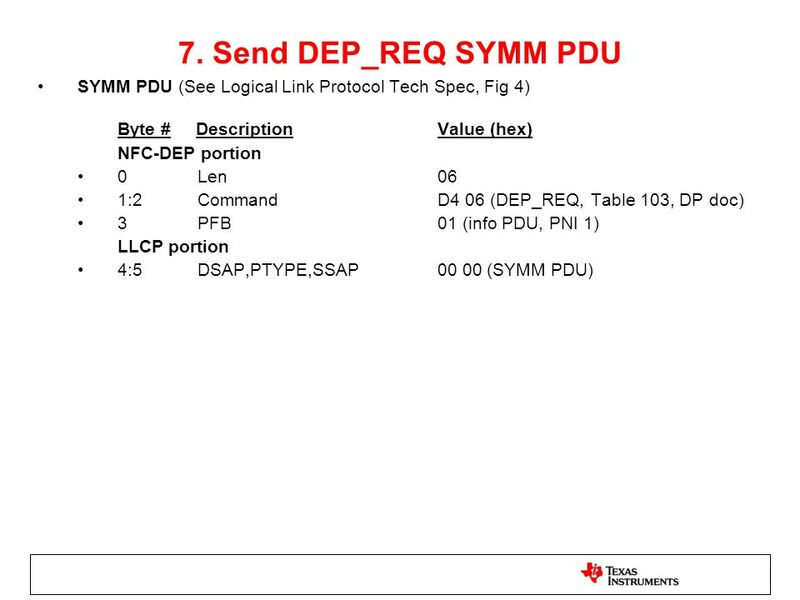 Send DEP_REQ SYMM PDU SYMM PDU (See Logical Link Protocol Tech Spec, Fig 4) Byte # Description	Value (hex) NFC-DEP portion 0	Length 06 1:2	Command D4 06 (DEP_REQ, Table 103, DP doc) 3	PFB	00 (info PDU, PNI 0, Table 105, DP doc) LLCP portion 4:5	DSAP,PTYPE,SSAP (SYMM PDU) The symmetry procedure provides the appearance of asynchronous balanced mode (ABM) communication on top of MAC layers operating in normal response mode (NRM) and enables link loss detection. By performing the symmetry procedure, the peers mutually pass permission to send back and forth. The link timeout (LTO) parameter allows each peer to determine when communication over the LLCP Link has become impossible. After receipt of an LLC PDU, the receiving LLC SHALL commence sending an LLC PDU to the remote LLC within the time interval determined by the link timeout (LTO) parameter of the local LLC. In case no other PDU can be sent, the LLC SHALL send a SYMM PDU prior to the expiration of the LTO of the local LLC. After sending an LLC PDU, if reception of a PDU from the remote LLC does not commence within the time interval determined by the remote LLC’s link timeout (LTO) parameter, the local LLC SHALL execute the LLC link deactivation procedure (cf. Section 5.4). Compliance to the symmetry procedure SHALL be verified by observing the communication traffic between the peer devices. 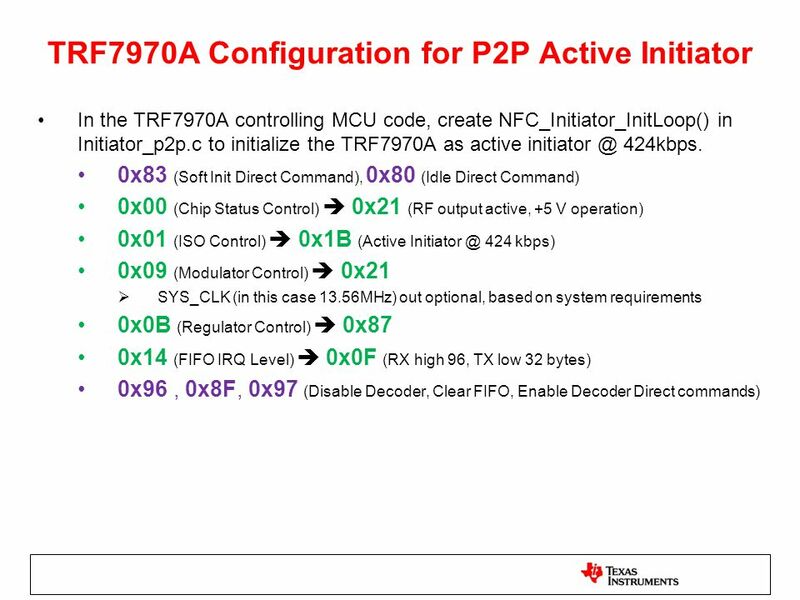 The initiator and the target can exchange asynchronous commands back and forth, incrementing the PNI value to ensure the two devices are still in proximity of one another. The Packet Number Information (PNI) bit counts the number of packets sent by the Initiator to the Target, and vice versa, starting with 0. note: can go up to 3 and start over at 0 These bits are used for error detection during protocol handling. These PDUs can be sent back and forth as long as the connection exists, and are sent until either side wants to connect and send data. This is analogous to Bluetooth™ operations where devices can be paired, but not connected yet. 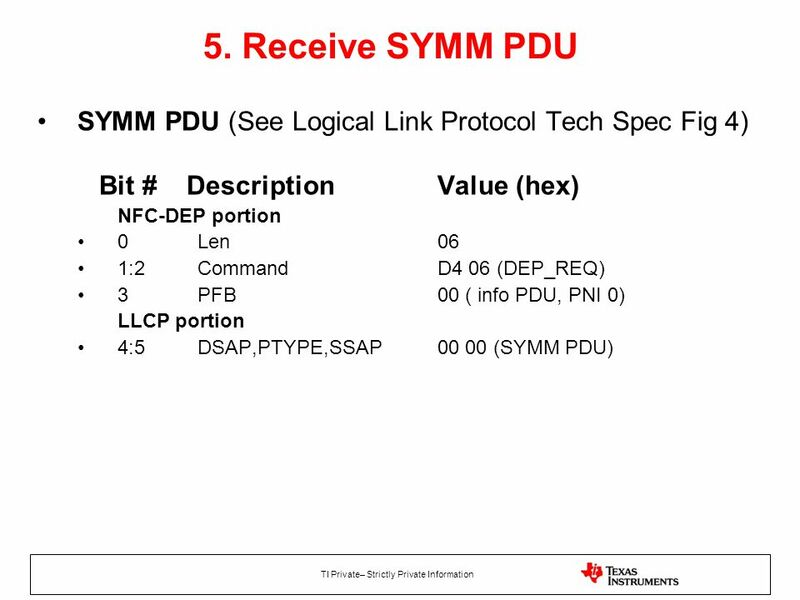 SYMM PDU (See Logical Link Protocol Tech Spec, Fig 4) Byte # Description	Value (hex) NFC-DEP portion 0	Len 06 1:2	Command D5 07 (DEP_RES) 3	PFB	01 (info PDU, PNI 1) LLCP portion 4:5	DSAP,PTYPE,SSAP (SYMM PDU) Here we are showing the response to the SYMM PDU – note the PNI is 1, matching the request…this can go up to PNI = 3 and start over again, as long as the devices are in proximity of each other. 13 9. 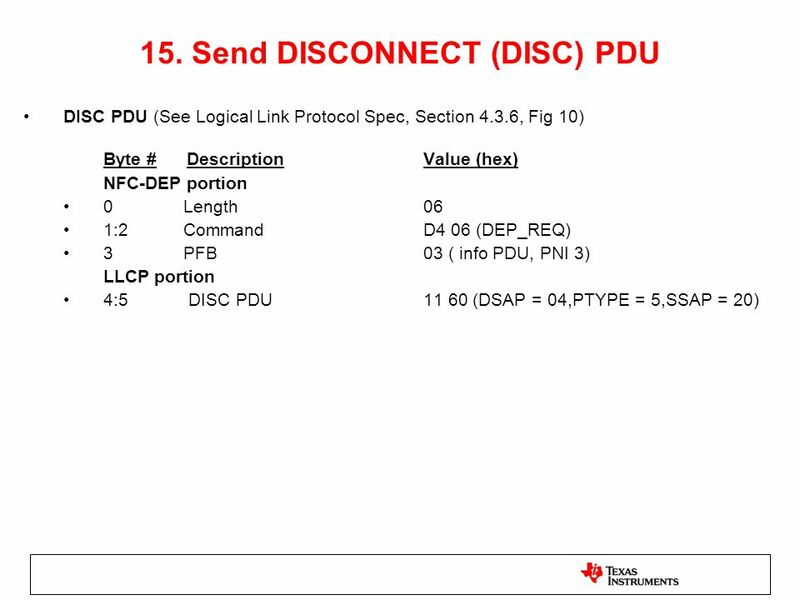 Send CONNECT PDU CONNECT PDU (See Logical Link Protocol Spec, Section 4.3.5, Fig 9) Byte # Description	Value (hex) NFC-DEP portion 0	Len 1E 1:2	Command D4 06 (DEP_REQ) 3	PFB	01 ( info PDU, PNI 1) note: PNI value varies based on where process is LLCP portion 4:5	DSAP,PTYPE,SSAP (CONNECT PDU) 6	Type	06 ( Service Name) 7	Length	0F 8:22	Service Name	“urn:nfc:sn:snep” 23:26 TLV: MIUX 27:29	TLV: RWS NOTE: (Section , LLP doc, this # can go up to 0F, which can	increase throughput to the initiator) The CONNECT PDU is an unnumbered PDU which is used to request a data link connection between a source and a destination service access point. The information field of the CONNECT PDU MAY contain connection specific parameters. These parameters SHALL be encoded as a contiguous sequence of TLV elements and each TLV element SHALL be encoded as defined in Section 4.4 of the LLP Spec. 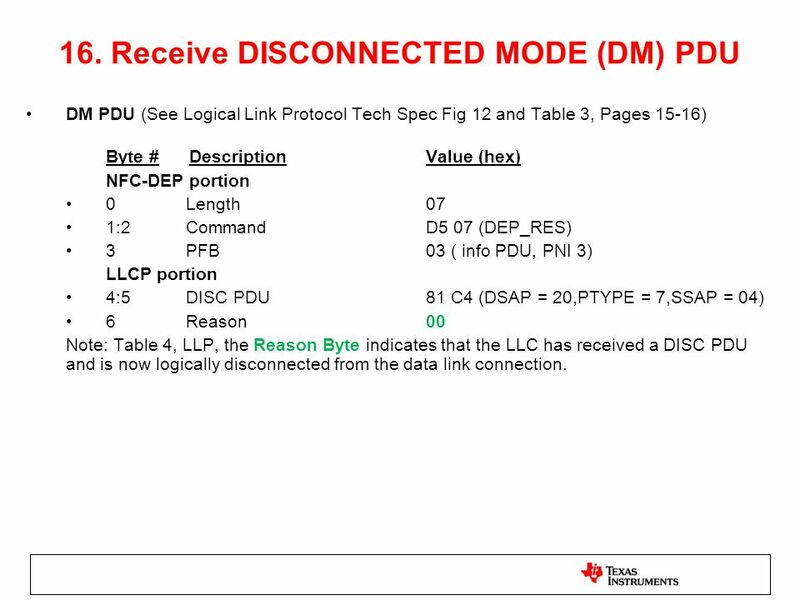 The LLC parameters that are allowed in the information field of a CONNECT PDU are defined in Section 4.5 of the LLP Spec. 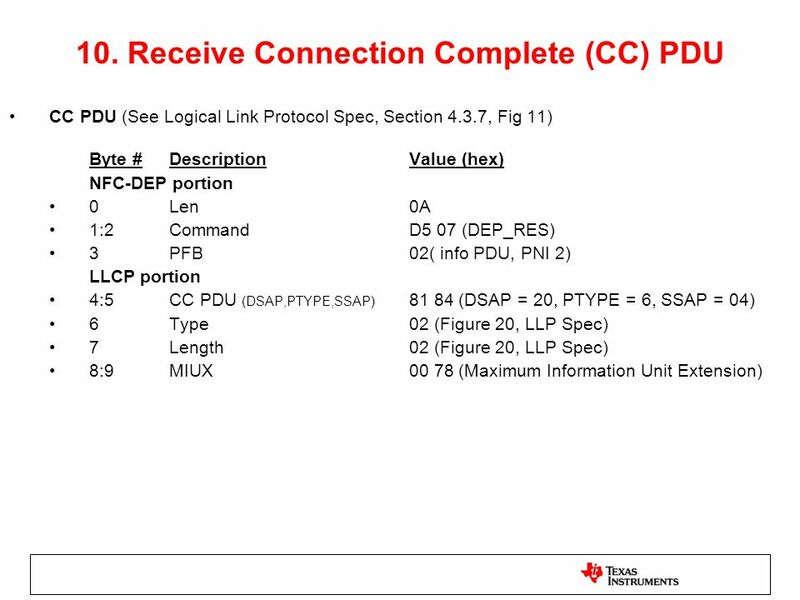 The receiver of a CONNECT PDU SHALL ignore any TLV elements that are not defined in Section 4.5 of the LLP Spec. 17 12. 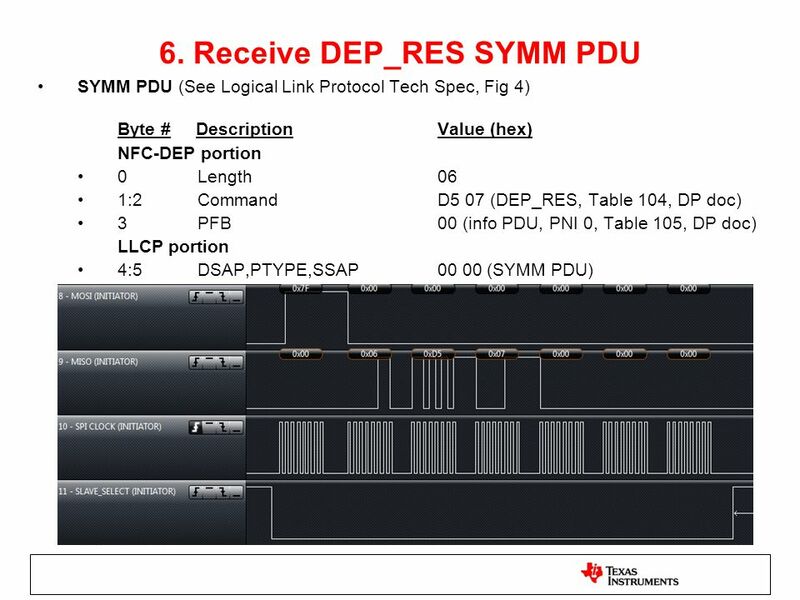 Receive RR PDU RR PDU (See Logical Link Protocol Spec Section , Fig 15) Byte # Description	Value (hex) NFC-DEP portion 0	Length 07 1:2	Command D5 07 (DEP_RES) 3	PFB	00 ( info PDU, PNI 0) LLCP portion 4:5	PP PDU (DSAP=20,PTYPE=D,SSAP=04) 6	Sequence	01 (Sequence Number N(R)) The RR PDU is a numbered PDU which is used by an LLC to acknowledge one or more received I PDUs and indicate that the LLC is able to receive subsequent I PDUs. 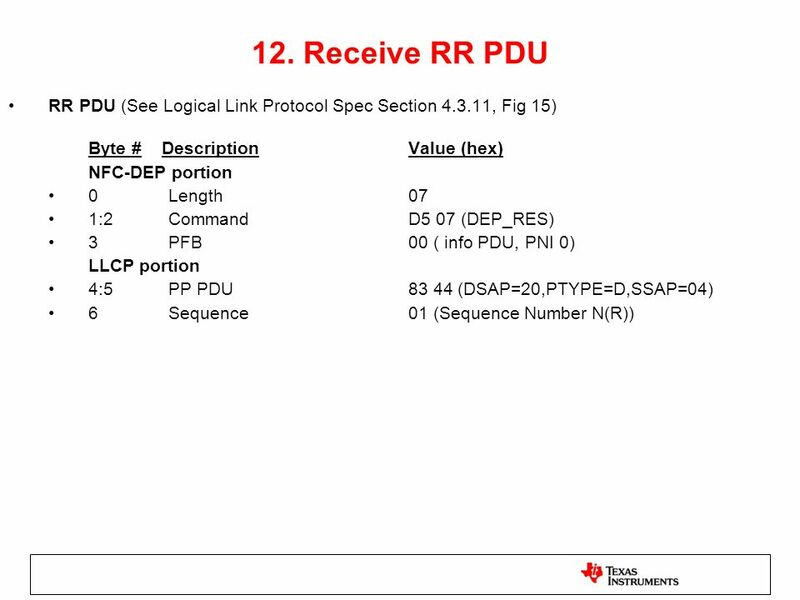 The RR PDU SHALL have the format shown in Section , Figure 15 (page 23 of the LLP spec). The RR PDU sequence field SHALL contain the receive sequence number N(R). The receive sequence number N(R) SHALL indicate that I PDUs numbered up through N(R) - 1 have been received correctly by the sender of this I PDU and successfully passed to the senders SAP identified in the SSAP field. These I PDUs SHALL be considered as acknowledged. The higher nibble of the sequence field SHALL be set to zero by the sender and SHALL be ignored by the receiver. 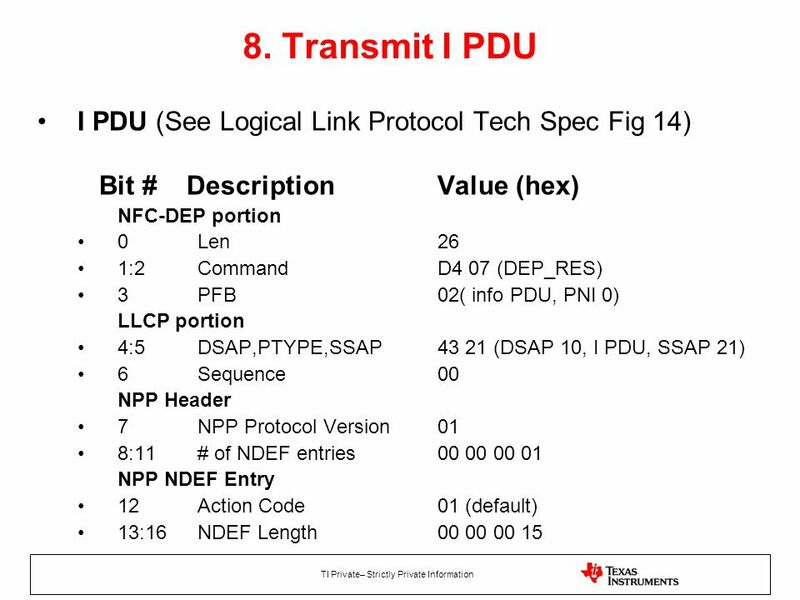 I PDU (See Logical Link Protocol Spec, Section , Fig. 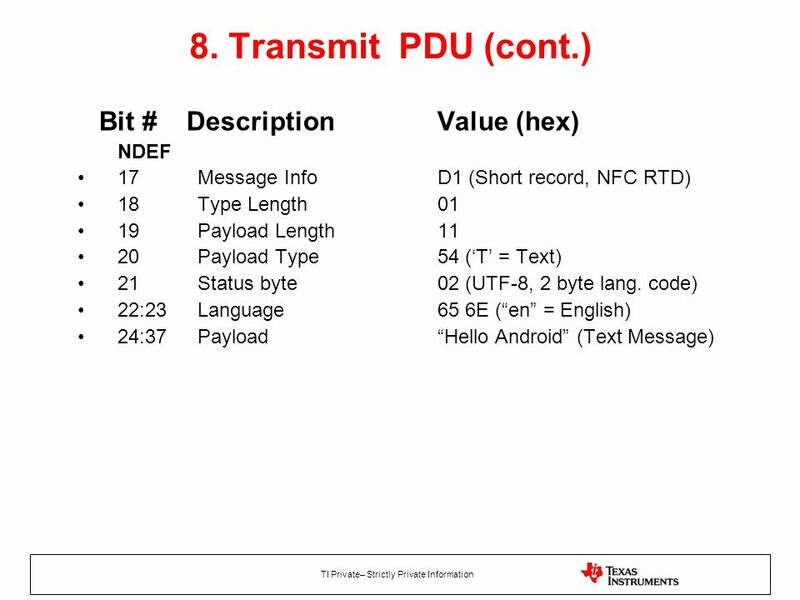 14) Byte # Description	Value (hex) NFC-DEP portion 0	Length 0D (13 bytes) 1:2	Command D5 07 (DEP_RES) 3	PFB	01 (info PDU, PNI 1) LLCP portion 4:5	I_PDU (DSAP,PTYPE,SSAP) (DSAP 20, PTYPE = C, SSAP = 04) 6	Sequence	01 SNEP Response Message 7	SNEP Protocol Version	10 (SNEP v1.0) 8	Response	81 (Success, Table 3, SNEP) 9:12	Length (no information) Most likely preceded by at least one SYMM command from Initiator, for larger payloads, the success I-PDU (0x81) would be replaced with a continue I-PDU (0x80) after the first packet. The other packets just get acknowledged with an RR PDU, then the last one gets both RR and Success I-PDU. The I PDU is a numbered PDU which is used to transfer service data units across a data link connection. The format of the I PDU SHALL be as shown in Figure 14, where n is the length of the I PDU. The I PDU sequence field SHALL contain two sequence numbers: The send sequence number N(S) and the receive sequence number N(R). 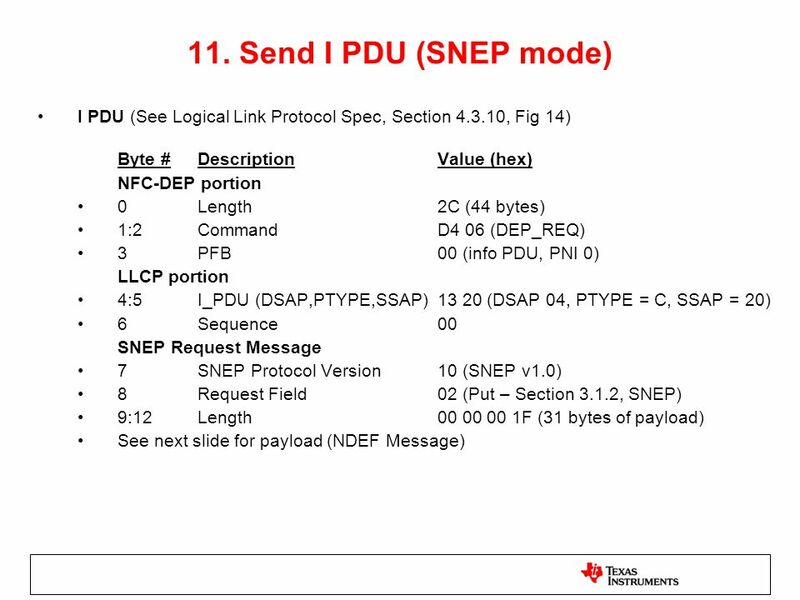 The send sequence number N(S) SHALL indicate the sequence number associated with this I PDU. The receive sequence number N(R) value SHALL indicate that I PDUs numbered up through N(R) - 1 have been received correctly by the sender of this I PDU and successfully passed to the senders SAP identified in the SSAP field. These I PDUs SHALL be considered as acknowledged. The information field of an I PDU SHALL contain a single service data unit. The maximum number of octets in the information field SHALL be determined by the MIU for the data link connection as described in Section The information field of an I PDU MAY be empty. 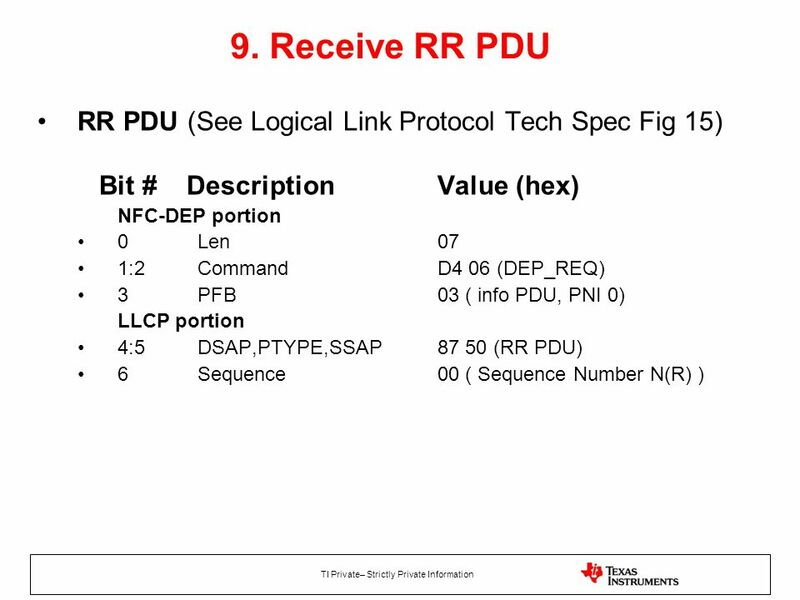 RR PDU (See Logical Link Protocol Spec Section , Fig 15) Byte # Description	Value (hex) NFC-DEP portion 0	Length 07 1:2	Command D4 06 (DEP_REQ) 3	PFB	02 ( info PDU, PNI 2) LLCP portion 4:5	RR I-PDU (DSAP = 04,PTYPE = D,SSAP=20) 6	Sequence N(R)	01 To acknowledge the success I-PDU, replied to with a symmetry. The RR PDU is a numbered PDU which is used by an LLC to acknowledge one or more received I PDUs and indicate that the LLC is able to receive subsequent I PDUs. The RR PDU SHALL have the format shown in Section , Figure 15 (page 23 of the LLP spec). The RR PDU sequence field SHALL contain the receive sequence number N(R). The receive sequence number N(R) SHALL indicate that I PDUs numbered up through N(R) - 1 have been received correctly by the sender of this I PDU and successfully passed to the senders SAP identified in the SSAP field. These I PDUs SHALL be considered as acknowledged. The higher nibble of the sequence field SHALL be set to zero by the sender and SHALL be ignored by the receiver. 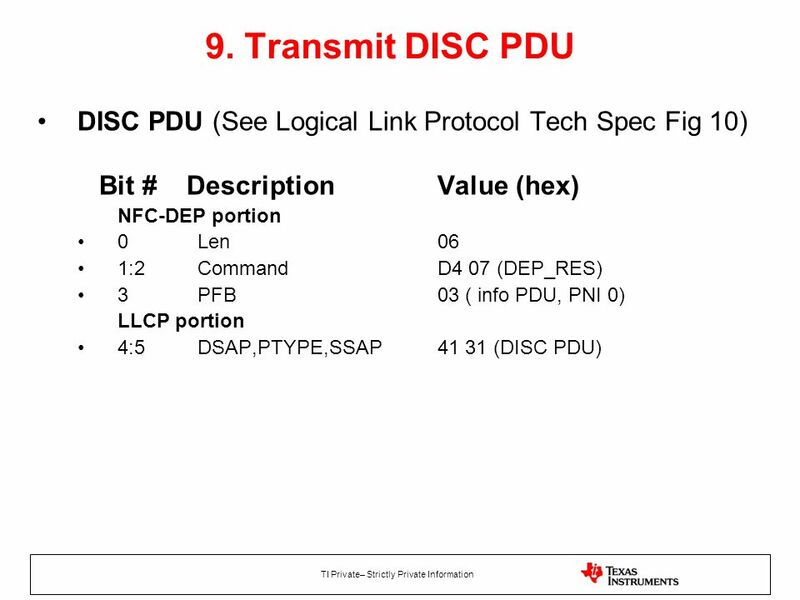 DISC PDU (See Logical Link Protocol Spec, Section 4.3.6, Fig 10) Byte # Description	Value (hex) NFC-DEP portion 0	Length 06 1:2	Command D4 06 (DEP_REQ) 3	PFB	03 ( info PDU, PNI 3) LLCP portion 4:5	DISC PDU (DSAP = 04,PTYPE = 5,SSAP = 20) The DISC PDU is an unnumbered PDU which is used to terminate a data link connection or is used to deactivate the LLCP L The DISC PDU SHALL have the format shown in Section 4.3.6, Figure 10 (page 19) in the LLP spec. 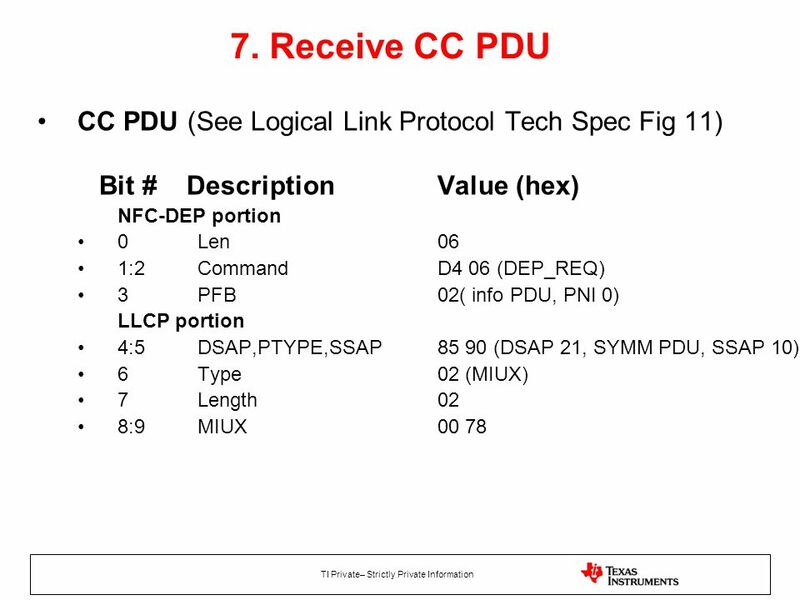 DM PDU (See Logical Link Protocol Tech Spec Fig 12 and Table 3, Pages 15-16) Byte # Description	Value (hex) NFC-DEP portion 0	Length 07 1:2	Command D5 07 (DEP_RES) 3	PFB	03 ( info PDU, PNI 3) LLCP portion 4:5	DISC PDU 81 C4 (DSAP = 20,PTYPE = 7,SSAP = 04) 6	Reason	00 Note: Table 4, LLP, the Reason Byte indicates that the LLC has received a DISC PDU and is now logically disconnected from the data link connection. The DM PDU is an unnumbered PDU which is used to report status indicating that the LLC is logically disconnected from the data link connection identified by the DSAP and SSAP address pair. The DM PDU SHALL have the format shown in Section 4.3.8, Figure 12 (page 20) in the LLP spec. 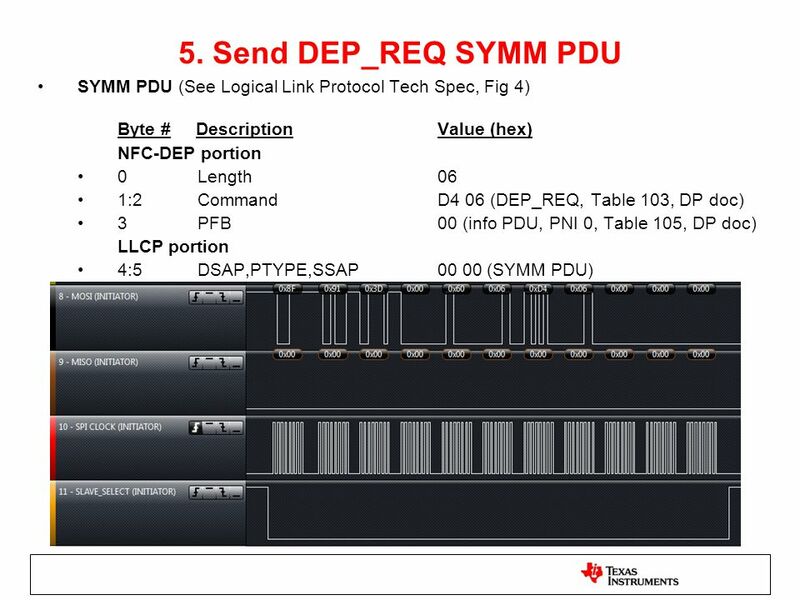 To send message from MSP430 to phone: (Phone in tag discovery/reader mode) Receive SYMM. Reply CONNECT. Receive CC. Reply I PDU with message. Receive RR. Send DISC. Receive DM. 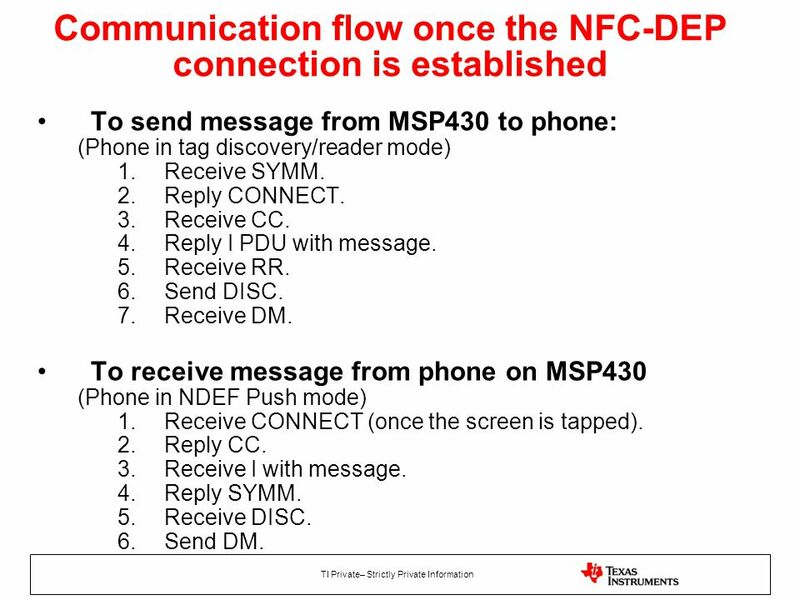 To receive message from phone on MSP430 (Phone in NDEF Push mode) Receive CONNECT (once the screen is tapped). Reply CC. Receive I with message. Reply SYMM. Receive DISC. Send DM. 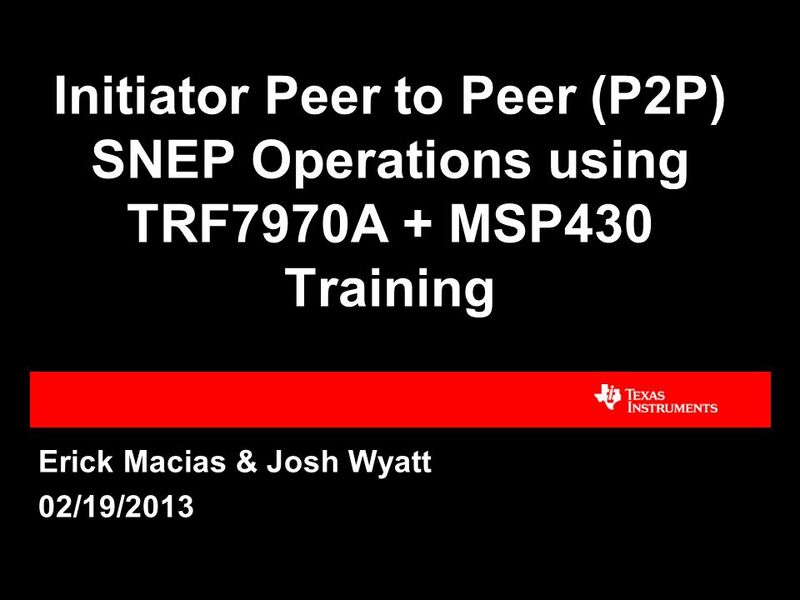 Download ppt "Erick Macias & Josh Wyatt 02/19/2013"
Arctic IEC-104 Gateway Jari Lahti, CTO. 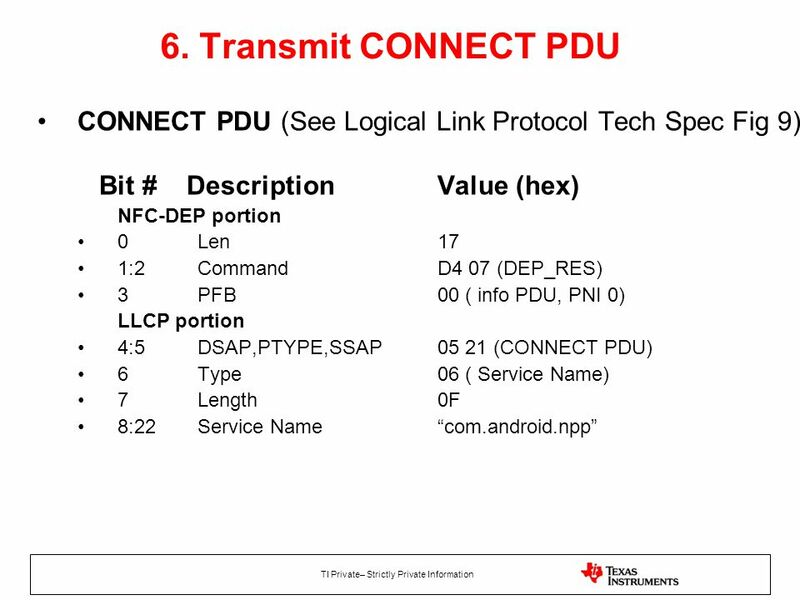 Data Link Protocols(HDLC & PPP). 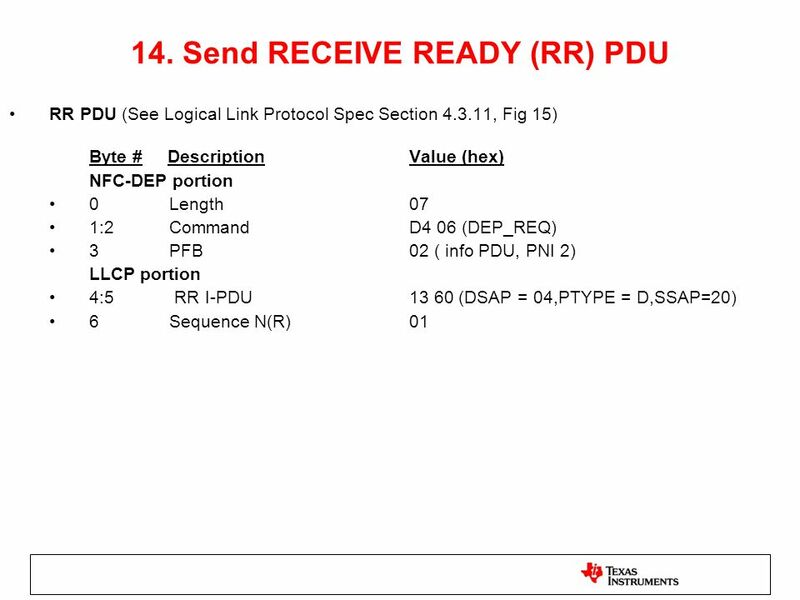 Data Link Protocols The set of specifications used to implement the DLL. 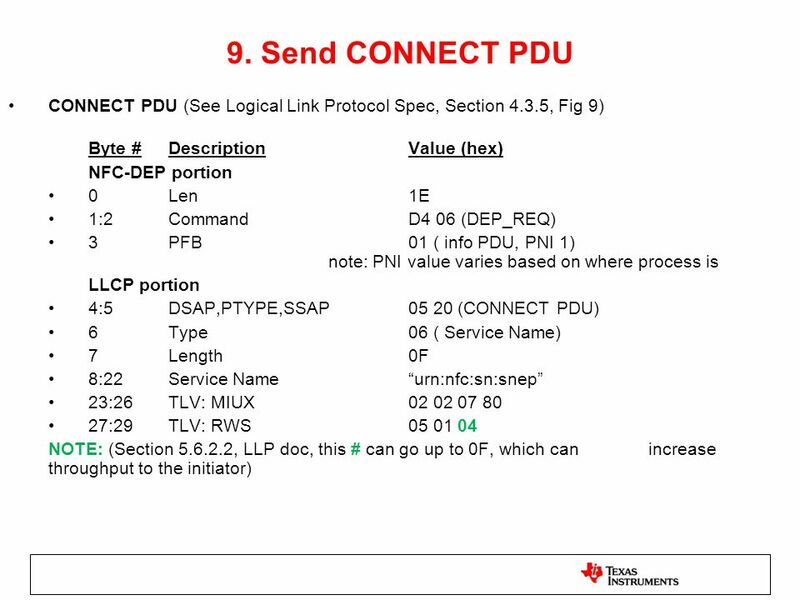 DLL Protocols Synchronous Protocols Character-oriented. 1 SpaceWire Update NASA GSFC November 25, GSFC SpaceWire Status New Link core with split clock domains complete (Much faster) New Router core. Understanding IPv6 Slide: 1 Appendix A Link-Layer Support for IPv6. 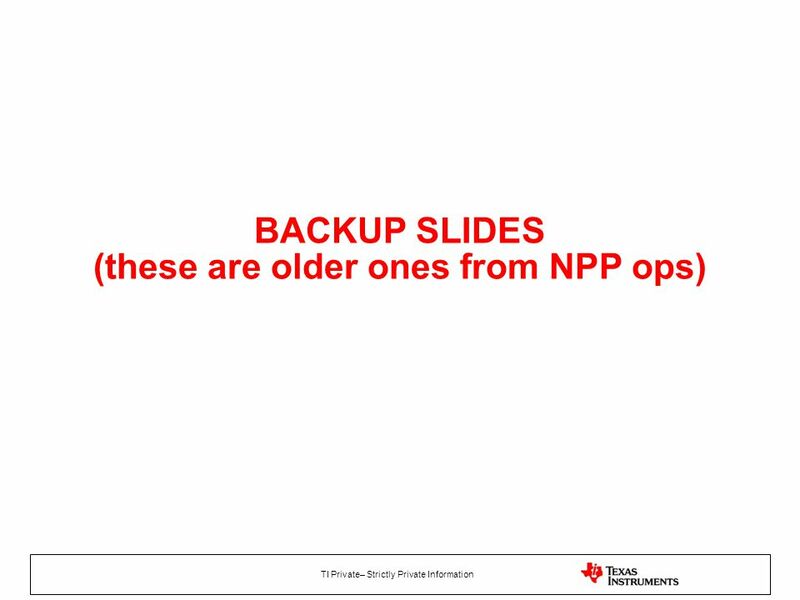 Microsoft Windows Server 2003 TCP/IP Protocols and Services Technical Reference Slide: 1 Lesson 1 Local Area Network (LAN) Technologies. Chapter 12 Transport protocols. Outline 12.1 introduction 12.2 TCP/IP protocol suite. LOCAL AREA NETWORKS. LOGICAL LINK CONTROL LLC is concerned with the transmission of a link- level PDU (Protocol Data Unit)between two stations Addressing. Data and Computer Communications Updated: 2/9/2009. Shivkumar Kalyanaraman Rensselaer Polytechnic Institute 5-1 Internet Protocol (IP): Packet Format, Fragmentation, Options Shivkumar Kalyanaraman Rensselaer. 1 27-Jun-15 S Ward Abingdon and Witney College VLAN Trunking protocol CCNA Exploration Semester 3 Chapter 4. 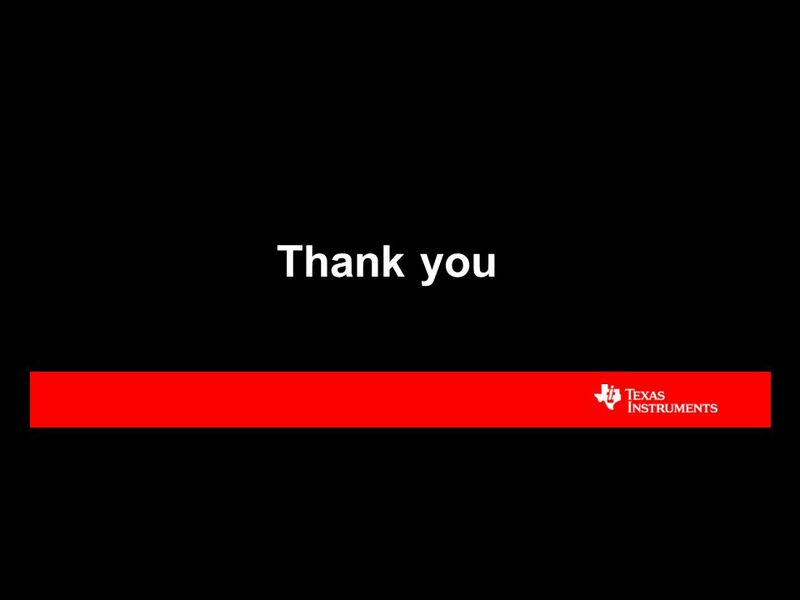 PicoPass 32K(S) Card Operations with the TRF79xxA Texas Instruments S2 MCU NFC/RFID Apps/Systems Team Training Module #6 09/14/2014. Cisco Public © 2013 Cisco and/or its affiliates. All rights reserved. 1. 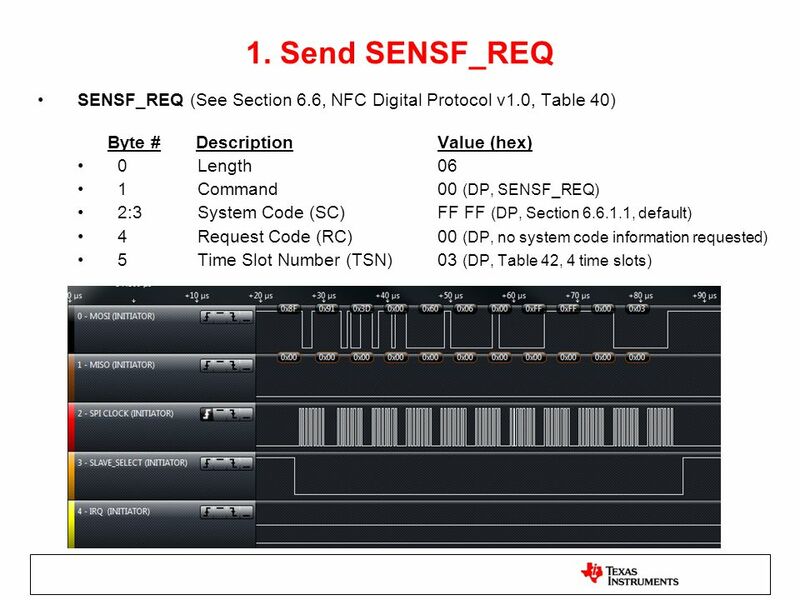 NFC Devices WG Infineon Technologies 30.01.2012 Change Request to Type 2 Tag Operation Specification 1.1 Remove inconsistency of memory size indication.